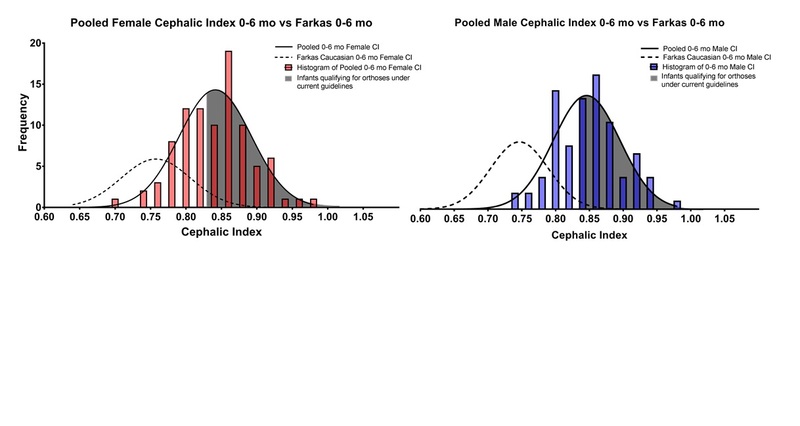 PURPOSE- This epidemiological study evaluates whether cephalic index (CI = the ratio of head width to length) values of infants and children have changed since the 1992 start of the Back to Sleep campaign. METHODS- Children ages 0-1 month, 4-6 months, 9-12 months, 2-3 years and 12- 14 years were recruited at their well child appointments. Exclusion criteria included prematurity, skull related diagnosis, gross developmental delay or torticollis. Calipers were used to measure CI. Parents were surveyed about demographic information and potential confounders of headshape. The mean and standard deviation for CI was calculated for each age group. RESULTS- The cohort includes 532 children. In the 0-1-month group (n=81), average CI was 0.82 (SD ±0.042). There were 99 patients in the 4-6-month group, with a mean CI of 0.86 (SD ±0.053). See attached graphic. CONCLUSIONS- Mean cephalic index of healthy children aged 0-1 month and 4-6 months was 0.83 and 0.86, respectively. These values are higher than previously established mean CI values for children under 6 months of .737(males) and .733(females) demonstrating a global change in CI after the introduction of the Back to Sleep campaign. Our study also shows that up to 57% of children may inappropriately meet criteria for a helmet based on the prior norms. By updating epidemiologic data to reflect current headshape, many children may be spared an unnecessary helmet orthosis.